Which are the zones of Venice worth visiting? Well, all of them. Every zone of Venice is rich in history and filled with treasures of art, though each of them has specific characteristics that make it unique. To start, Venice is officially divided in six neighbourhoods, called sestieri (from the word sei, six). 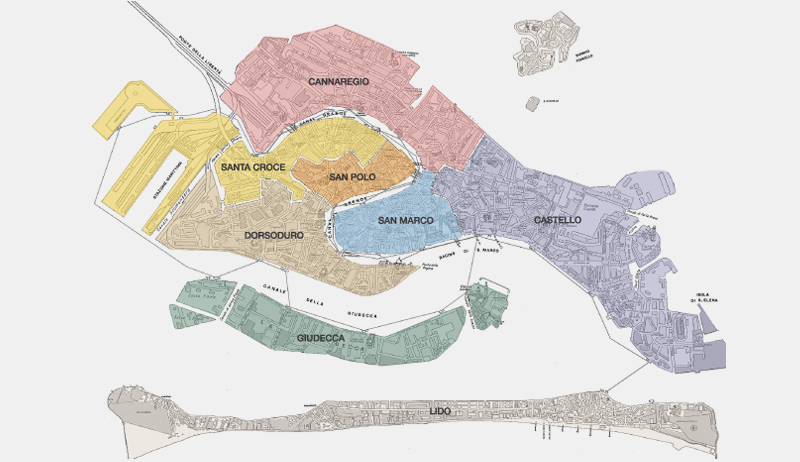 The sestieri of Venice are Cannaregio, Dorsoduro, Santa Croce, San Marco, Castello, San Polo. Moreover, there are the islands, which usually belong to one of the sestieri. The closest islands are Giudecca, San Giorgio and the Lido (though this does not belog to any sestiere). We would recommend you to not spend your time only around Saint Mark, but to have a look in the other areas of Venice, too. Start exploring them virtually thanks to our short guide on Venice neighbourhoods.